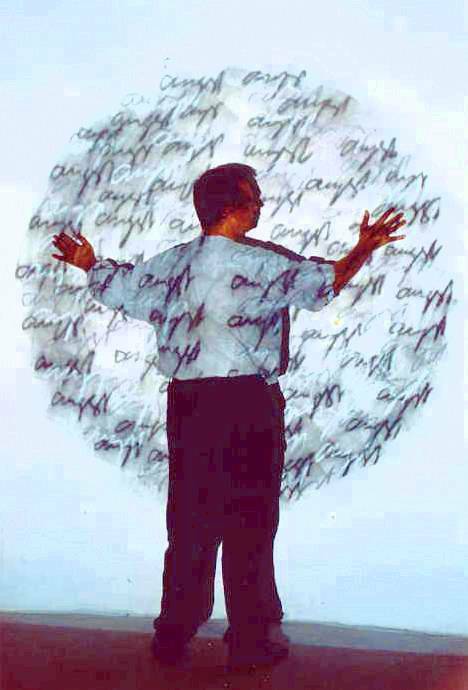 I use to take a pencil or a piece of chalk in my hand and to move my arm round and round over a wall, a door, or a sheet of paper, so that the chalk or pencil leaves traces like a bundle of circles. I stress the pencil again and again at the same point. It's one of the few things I do without compass and ruler. The connection with jars is that the top of a jar is a circle. The top is the edge of the universe, out of which is nothing, or maybe everything. It's dangerous to leave the universe. So I connected those bundles of circles with the meaning "fear". I think fear is a very important factor in culture. It dictates a lot of human behaviour. Fear can lead to destruction. I wrote the Dutch word for fear "Angst" in a jar. I remembered that showing my work on exhibitions made me shy, fearful. A psycho-analyst might say that I fear the strong criticism of my mother, who was a painter herself and who was criticizing sharply everything I did. As "Destruction" before now I wanted to do something with the idea of "fear", that what leads to destruction. When I was invited to exhibit on the walls of a 4 room gallery I filled three rooms with sun jars, but in the first room I painted 3 dark fear circles. 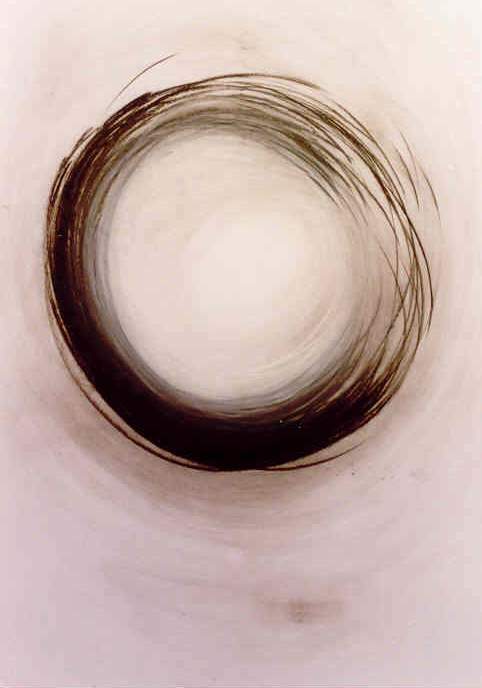 I first constructed the circles, each 170 high, then I filled the circles with ink and after I went round and round with a piece of black chalk, leaving bundles of circle traces. Finally I wrote the word "angst" many times on the circle surfaces. I shared the rooms with another artist, who brought four objects: moving machines with wheels and strings. I suggested to share the two middle rooms and to take the two end rooms each for one of us. But both end rooms were missing something. The two objects in the last room did not fit together, while my 3 fear circles in the first room seemed to miss something. We were discussing how to solve this problem. He suggested, jokingly, to erase one of the three circles in order to make a part of the room free for his installation. I responded with the joke that I did better connect my circles with lines, like his wheels were connected with strings. Only towards the opening of the exhibition I realized that I did better take my own joke seriously. I was reminded of a fearful dream I once had. In that dream I found myself stuck into a spider web of fine threads in space. I was not glued to the strings, I could move, but all the strings were endless. I could go anywhere, but any movement would only bring me to a place that was exactly the same. I connected my fear circles with thin endless strings, coming from under the floor and reaching out of the ceiling. Dealing with fear in public made me even fear more. And I noticed that many visitors, looking at the paintings, were not able to let the word get into their minds. 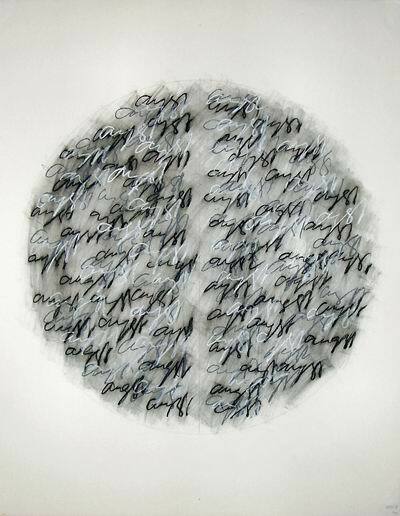 They could react on the powerful circle traces, but they couldn't say anything about the black words, hovering like clouds over the circle surfaces.